To download MP3s, please go to the MP3 page. This motherhood conference was given by Kathleen Nelson in January 2007. It has greatly impacted many families and we hope it will impact yours as well! The CDs have been edited and split up into smaller tracks for listening ease. We are not going to make copies of the binders. We’ve obtained permission to copy many of the articles in the notebooks, but that does not extend to copies outside of the use for which we’ve requested. So because of copyright issues, we will not have the binders available in their seminar format. Please contact us if you would like to hold a seminar in your city. This audio book covers a vast array of Christian parenting basics including: vision, love, discipline, and life purpose. 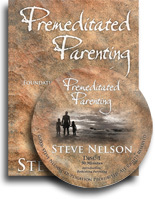 It is essential listening for parents who desire to raise children who have a passion for God and a heart for people. It is filled with touching stories, biblical wisdom, and practical application. Whether you need foundational advice or just a little encouragement, this will inspire you!